This is amazing inspiration for writing and much, much more! Such a great family! If you are reading my blog, you probably want to be a writer. This should mean that you are also writing. If not, what’s stopping you? I meet many new or wanna-be writers. I write for a living and when they learn this, they always tell me how lucky I am. Then they tell me why they don’t have time . . . money . . . space to write. Basically, something is in their way and because of it they cannot write. They need to watch this video. Now, tell me again. What is standing in your way? It started innocently enough, back in 2006 or 2007 (my memory for details is not so hot, I must confess). An occasional sci fi convention attendee, I was scanning some newspaper or magazine when I came upon the mention of Comic Con. The biggest sci fi convention of them all, it proclaimed – a must to attend if you liked media, pop culture, and all things speculative fiction. Intrigued, I researched the con and made arrangements to attend. I’m always on the lookout for opportunities to meet editors and agents, and to see what new and exciting developments are in the works for an eager wordsmith such as myself. I’d really enjoyed a World Con (World Science Fiction Convention) that I had attended in Los Angeles some years prior, mainly because of the media presence in movies and TV, so I hoped to have a similar experience (that World Con is also near to my heart because it’s where I first met fellow XC author Janet L. Loftis). It helped that Comic Con has traditionally been held in beautiful San Diego, where the weather is almost universally pleasant and the ocean atmosphere permeates the town so completely that my hair never fails to frizz up in the salt-drenched moist air. The city’s beaches, open-air shopping and Embarcadero San Diego strolling, attractions such as Sea World, Zoo, Wild Animal Park, and the museums and eye-catching architecture of Balboa Park make it a destination unto itself, which is complemented by its pleasant atmosphere and general friendliness. The gigantic Sangrias* and the Spanish architecture of the bygone era make Old Town a favorite as well. (*La Pinata is my preferred destination for this, a colorful, festively decorated restaurant in an authentic, although somewhat crowded former home.) What I’m getting at with all this tourist-brochure rambling is that San Diego is a great place to visit, and the entire city embraces tourists with open arms. And that’s not an exaggeration. Really! First of all, there was the crowds. Attendance is capped at 130,000, and every single one of those people was mushed into the Exhibit Hall or in the regular halls or occupying the stalls in the ladies bathroom. Okay, maybe not this last one, but it did seem like it sometimes. As a consequence of all these people, there were lines for everything. The lines had lines. 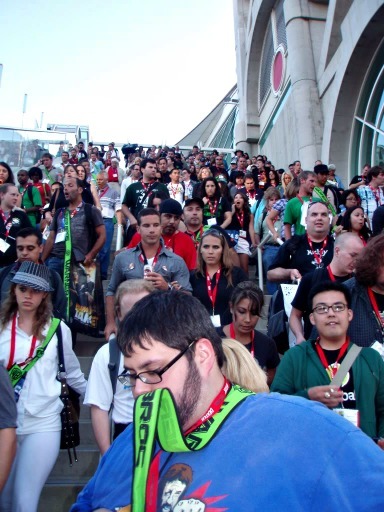 The most horrid lines occurred for events in Hall H which attracts the biggest of the big names (think movie stars like Angelina Jolie) and Ballroom 20, which has panels for favorite TV shows like Dexter and Vampire Diaries, etc. But lines were everywhere and soon I learned to just resign myself to waiting in them for some length of time pretty for much no matter what I wanted to do. I’ve found that such resignation is a helpful attendant as you shuffle along through the bustling crowds at .2 miles per hour. If, by some lottery-like chance, you don’t encounter a line for whatever you want to do at the time you’ll be pleasantly surprised. So there were the lines. And the crowds. The lines and crowds were not altogether boring and traumatic, however. The good part about lines is that you meet a lot of great people standing next to you – in fact, I met two of my very good friends that way in a subsequent year. And the crowds, while intimidating initially, are almost universally polite, good-natured, and just plain interesting to look at. This is primarily due to the never-ending creativity of the cosplayers, and their happy vanity – I’ve never once had a request to take a picture denied. People watching, then, is a constant amusement at Comic Con. Well-adjusted adult male – I mean, cosplayer. What are all these people waiting in line for, you might wonder? Mainly previews of upcoming TV shows, movies, video games, novels, and whatnot. Okay, so when I put it like that it’s not that interesting, huh? The panels are just plain fun. You get to see clips, trailers, and sometimes entire episodes or movies before anyone else. Those poor slobs resting comfortably in their homes don’t know what they’re missing! You have a chance to see your favorite celebrity in all of his/her obscenely beautiful, anorexic glory, entertaining you with anecdotes and personal details. You might even get to ask them a question, if you are fast enough to scurry up to the microphone before everyone else. Yes, that’s right, your celebrity crush might LOOK at you and SPEAK to you. Maybe that doesn’t sound all that great, either. Well, allow me to continue. In addition to previews, other panels are informative (How to Break into Hollywood, Bookkeeping for Creative Professionals, Origins of the Zombie Apocalypse, and so forth). A particularly amusing one that I recently attended was two teams of lawyers arguing about whether or not a person who had turned into a zombie but later recovered could be held criminally liable for a murder committed while zombified. This is CRUCIAL information for you to have, people! The author, looking rather unconcerned with her impending doom. One of my favorite places to visit is the Exhibit Hall. What’s so great about an 8 million square foot room filled with weird people hawking their wares, you might wonder? Well, where else are you going to see half-naked hotties dressed in 18th century pirate costumes? 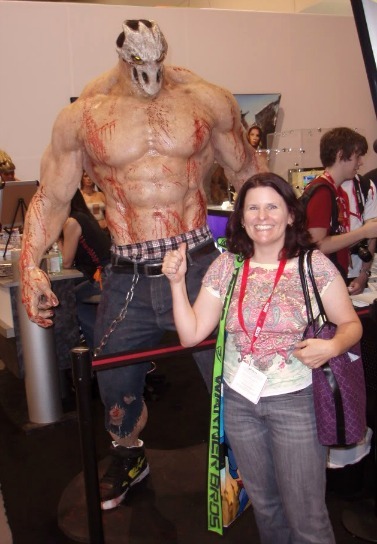 Where else can you stand in line for a photo of you stabbing to death an armor-plated troll? Where else can you purchase various whips, chains, collars and corsets made from leather, steel, and watch parts? Actually, now that I think about it, there are rather, er, alternative stores in the seedy neighborhoods of cities where such is possible. Let’s ignore that for now. Other highlights that I have experienced while browsing the Exhibit Hall over the years are: 18 foot tall Lego sculptures of various cartoon/movie characters, 3-D printers building plastic gee-gaws before your very eyes, countless purveyors of printed materials featuring zombie bunnies, animated microbes, demonized pumpkins, and beanie-wearing mutant insect superheroes. My personal favorite, however, are the far-off glimpses of hunky young actors scribbling autographs furiously while nervously eyes the eager swarming crowd and realizing that the security guards protecting them are of little use against a stampede of Red Bull-fueled gaggle of shrieking preteen girls. Here also celebrity sightings are common. One year I was pushed aside by a circle of black suit-wearing security personnel who were surrounding a short, strolling, nicely coiffed guy who looked alarmingly like Neil Patrick Harris. Turned out it was Neil Patrick Harris. Another time I saw, in a period of 5 minutes, Gene Simmons from KISS, Geordie and Data from Star Trek: The Next Generation, and my childhood crush Paul Michael Glaser, he of the original Starsky and Hutch, now manning a table that sold his children’s book. 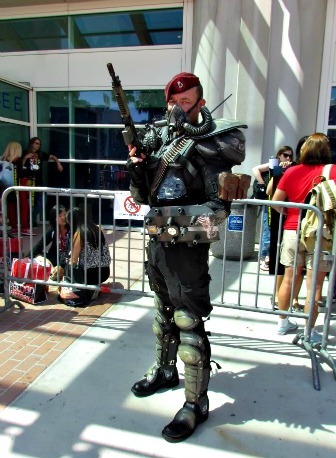 Take a look at Time Magazine’s walk around Comic Con for a quick video of the craziness.